This February, New York University Press will publish The Epistle on Legal Theory edited by Joseph E. Lowry (University of Pennsylvania). The publisher’s description follows. 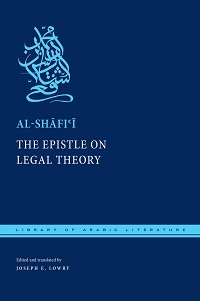 The Epistle on Legal Theory is the oldest surviving Arabic work on Islamic legal theory and the foundational document of Islamic jurisprudence. Its author, Muhammad ibn Idris al-Shafi’i (d. 204H/820AD), was the eponymous founder of the Shafi’i legal school, one of the four rites in Sunni Islam. This fascinating work offers the first systematic treatment in Arabic of key issues in Islamic legal thought. These include a survey of the importance of Arabic as the language of revelation, principles of textual interpretation to be applied to the Qur’an and prophetic Traditions, techniques for harmonizing apparently contradictory precedents, legal epistemology, rules of inference, and situations in which legal interpretation is required. The author illustrates his theoretical claims with numerous examples drawn from nearly all areas of Islamic law, including ritual, commercial law, tort law, and criminal law. The text thus provides an important window into both Islamic law and legal thought generally and early Islamic intellectual history in particular. The Arabic text has been established on the basis of the two most important critical editions and includes variants in the notes, while the English text is a new translation by a leading scholar of Shafi’i and his thought. The Epistle on Legal Theory represents one of the earliest complete works on Islamic law, one that is centrally important for the formation of Islamic legal thought and the Islamic legal tradition.